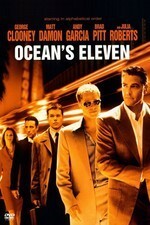 So after 3 nights in Las Vegas what better movie to watch on the flight home than Ocean’s Eleven – the Clooney/Pitt version. I do have the original rat pack version in my library which I will review at some point on this movie-a-day-for-a-year journey. Amusing that the stranger, sitting beside me on flight, she opted for The Hang over, another Vegas set movie. Here we have Clooney and his crew looking to rob 3 Las Vegas casino’s of their large cash reserves on fight night. The action is setup by’n’large around the infamous Bellagio hotel. If you don’t know what one that is, then you aren’t alone. I rang my 9 year son one bright morning and said to him I was in Las Vegas. Silence. Okay, I am standing in front of the hotel with the big fancy water fountain that was in Ocean’s Eleven. He bursts into a wave of excitement and envy. So now you know. This outing was an extremely fun outing that they boys should have stopped at and not made the subsequent two follow up movies. This was near on perfect; sharp dialogue, beautiful scenery, top notch cast, nearly believable story line and clever set pieces you were hard pushed to see coming. Now while they shouldn’t have made the follow up movies, the on screen dynamic of Pitt and Clooney works extremely well. They nearly capture the Frank Sinatra and Dean Martin dynamic of the original. Andy Garcia plays the villain with great effectiveness with Julia Roberts providing the beauty of the ensemble. Clooney is irritability good looking and suave in this, as he wears a tuxedo in a button down, tie undone way better than when all done up. Pitt is another fashion statement strutting his stuff around the screen. The others don’t get the same clothing budget as our top two stars. Ocean’s Eleven, while a departure from the Sinatra outing, stays close enough to the spirit of the original as to not disservice its good memory. Thoroughly enjoyable romp and especially fun to watch if you have just been a guest in the sin city.